Snrky: But wouldn't that imply you ever were? But wouldn't that imply you ever were? Post-technical is not a term I've heard to describe someone who has moved beyond developer into the ranks of management. It's rather appropriate to be sure, but when a friend described himself as such over dinner last week, I couldn't help but laugh. Title: But wouldn't that imply you ever were? 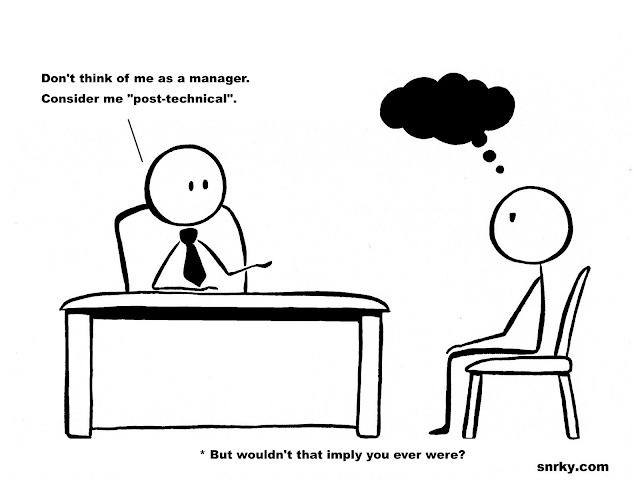 Snarky: Don't think of me as a manager. Consider me "post-technical". Ha...I'm going to start referring to you as pre-managerial.